Although the dates of the 2018 Xerox annual shareholder meeting have yet to be announced (reports indicate it will be held before the end of June), activist shareholders Darwin Deason and Carl Icahn have launched a full-court press to convince Xerox shareholders to vote against the proposed acquisition of Xerox by Fuji announced previously and to approve four individuals who have been nominated by Carl Icahn to serve on the Xerox board of directors. Icahn, who pushed hard for the Conduent spinoff, owns approximately 9.2 percent of Xerox outstanding shares, making him Xerox's largest shareholder. Deason—who sold Affiliated Computer Services to Xerox in 2010—comprises Xerox's third largest shareholder, with a roughly 6 percent ownership stake. Claiming financial underperformance, executive mismanagement, as well as poor governance by the Xerox board of directors, they vehemently oppose the $6.1 billion transaction announced Jan. 31, 2018, which would enable Fuji to acquire a controlling stake in Xerox, essentially by combining the U.S.-based Xerox into their long-standing Pacific Rim and Far East joint venture, called Fuji Xerox. The proposed transaction, requiring shareholder approval, is structured whereby Fuji Xerox will become a wholly-owned subsidiary of Xerox, with Fuji acquiring a 50.1 percent ownership interest in Xerox and Xerox’s current shareholders owning the remaining 49.9 percent of the company. Fuji, in turn, would acquire its majority of shares of Xerox by giving to Xerox Fuji’s 75 percent ownership interest in Fuji Xerox. 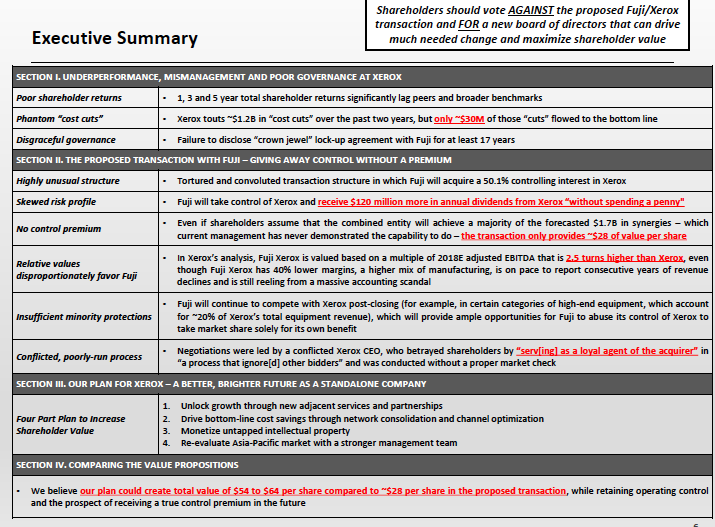 As promised, today we released a presentation explaining why Xerox shareholders need to vote to replace certain directors and to oppose the proposed Fuji scheme. Both the substance of the proposed value-destroying transaction and the conflict-tainted process by which it was hatched are an insult to long-suffering Xerox shareholders and make a mockery of well-established corporate governance norms. Fuji—with the able assistance of Xerox CEO Jeff Jacobson—appears to have been successful in putting one over on the board of directors of Xerox. However, the market cannot be so easily tricked. The closing price of Xerox stock last Friday (April 13, 2018), before many of the sordid details came to light, was $28.17 per share, which is approximately 14 percent below the closing price on the day prior to the announcement of the scheme and approximately 37 percent below management’s purported deal value of $45.00 per share. We could not have said it better ourselves. We fully expect that Xerox will not prevail in its shameful attempt to keep hidden from shareholders the many other sordid facts surrounding this unfortunate transaction that are still being concealed due to the machinations of Xerox’s lawyers. Despite their attempts to bury the truth, the fundamental economics of the scheme - which dramatically undervalue Xerox and disproportionately favor Fuji - are undeniable. Therefore, we are confident you will agree that the only choice here is to vote out the worst of Xerox’s directors and to oppose the proposed Fuji scheme. In their accompanying presentation (see executive summary on left or click here for PDF of complete arguments) they attacked the planned transaction on several fronts, including its structure, the higher valuation Xerox calculated for Fuji Xerox versus Xerox, and the negotiations that were led by Xerox CEO Jeff Jacobson. One of their biggest complaints resolves around a "crown jewel" lock-up agreement that was part of the Fuji Xerox joint venture (JV) agreement reached 17 years ago between the two companies, which "limits Xerox's strategic ability" such that Xerox could not pursue a sale to a strategic buyer or a private equity concern. The investors further point out that the lock-up agreement was not revealed to shareholders until nine days after the proposed Fuji deal was announced. 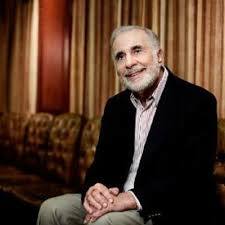 "This intentional deceit prevented shareholders from ever having the opportunity to push management to terminate or renegotiate the JV agreements, which would have given Xerox more flexibility to pursue strategic alternatives over the past 17 years," according to Icahn and Deason. They also claim that the large accounting scandal that occurred at Fuji Xerox last year could have enabled Xerox the opportunity to terminate the JV agreements "for material breach." Xerox CEO Jeff Jacobson remainsa prime target of Darwin Deason's lawsuit accusations. Fuji told Xerox CEO Jeff Jacobson that it was interested in an all-cash deal with a private equity partner in the summer of 2017, but Jacobson did not pass that information along to the Xerox board of directors or to Xerox's financial advisor, Centerview. Instead, he pursued the 50.1/49.9 percent structure. In the fall of 2017, Xerox's board of directors told Jacobson it was disappointed in his performance, was seeking a replacement and that he should discontinue further discussions with Fuji. It chose John Visentin as his replacement CEO, with a start date of early December 2017. But Xerox Chairman of the Board Robert Keegan changed his mind and allowed Jacobson to continue the Fuji discussions, without telling the board. The Xerox board was kept in the dark about what was transpiring until December 2017. HP reached out to Jacobson on Jan. 23, 2018, with interest in a possible transaction, but Jacobson and the Xerox board tell HP that it would have to execute what would be a complex transaction "quickly and aggressively." The board also did not consider a "Reverse Morris Trust" transaction with HP, which Centerview identified as a possible alternative in May 2017. Fuji rushed Xerox into signing a transaction on Jan. 31 in an attempt to thwart the Carl Icahn threat and proxy contest. One week before signing, Xerox's financial advisor, Centerview, acknowledged that the deal did not create enough value for Xerox shareholders and that the deal should not be announced Jan. 31. Keegan contends that Deason’s litigation distorts many of the facts regarding the proposed combination with Fuji Xerox. "Xerox strongly believes that Mr. Deason’s lawsuit is meritless and it will vigorously defend itself in legal proceedings," he said. "Xerox’s board of directors followed a comprehensive process in reaching its decision to approve the proposed transaction, including a comprehensive review of the company’s strategic and financial alternatives, as well as potential transaction structures and negotiations with Fujifilm over a 10-month period," Keegan added. 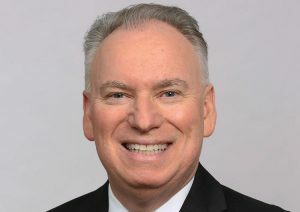 "Xerox CEO Jeff Jacobson was fully authorized to engage in discussions with Fujifilm and Fuji Xerox on the proposed combination. “As is absolutely clear from the record, Jeff Jacobson has always conducted himself with the utmost integrity as CEO and in negotiations with Fujifilm. At no point did he exceed the authority granted to him by the board’s chairman or the full board. The allegations by Mr. Deason to the contrary are part of his effort to distort the facts." In addition, Xerox has filed a preliminary proxy statement with the SEC (click here for PDF), which also describes the impetus behind what drove the transaction and provides its version of a timeline of events that led up to it. And, yesterday, Deason filed a motion (click here for PDF) with the Supreme Court of the State of New York, County of New York, seeking access to what it considers to be further material documents regarding the negotiations between Xerox and Fuji. Both companies are arguing that those documents should remain sealed because they deem them to contain competitively sensitive information that could be harmful if made public. Today, there were also brief articles on various general news sites that lawyers representing both Fuji and Xerox revealed the two companies were in active talks about renegotiating the $6.1 billion deal that was announced Jan. 31, presumably in reaction to the pending lawsuits and vocal opposition by Deason and Icahn. Assuming no new deal is reached that satisfies all concerns, however, it seems readily apparent that both sides will continue the battle through the general and financial press to sway Xerox shareholders to their respective sides leading up to the Xerox annual shareholder meeting. Hopefully not lost in all of the financial wrangling will be the employees, corporate culture and customer base that comprise Xerox - a key industry player in the graphic arts supply chain. 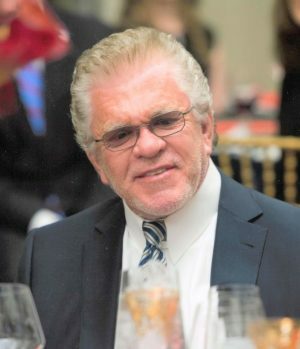 Obviously, Icahn and Deason are looking for maximum ROI payouts on their financial investments in Xerox. However, for the good of the graphic arts industry, we will all benefit for Xerox, or potentially Fuji Xerox, to remain as a prominent supplier of digital printing equipment, a technology innovator and a strong supporter of good industry causes for many years to come.